As a member of the Tyrolean ‘Wirtshaus’ culture initiative, the ‘Naturparkwirte Reutte/Lechtal’ association of restaurateurs and a holder of the AMA seal, the use of regional produce is guaranteed. Using regional suppliers is matter of great importance to us. The Dry Aging of meat is one of the oldest meat aging methods at all. The meat on the bone is suspended for a certain period of time under controlled temperature, humidity and air quality. It can be left alone in an air-tight plastic film and there it may do, what a meat likes to do: It may breathe. Thanks to this kind of procedure the refined, dry-ripened meat will get an inimitable, intense flavor. It will get a consistency that has nothing in common with a “normal” piece of meat. 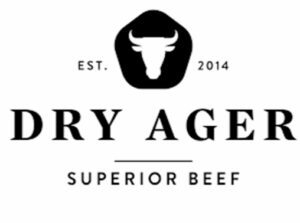 It is no wonder that Dry Aged Beef is known as “the royal class among the steaks” among connoisseurs. The most suitable meat for dry aging is beef, especially the backs of freshly slaughtered heifers, female young cattle. The meat becomes exceptionally tender, as it has a considerable fat cover and a particularly high intramuscular fat content. The more time a piece of meat is spending in the DRY AGER (4-6 weeks), the more intense the taste will be. During this time it smells like ham and musk, a freshly baked yeast braid, white frost and a bit of wool socks in the DRY AGER. The dry aged meat becomes black like a blood sausage and hard like bread crust. Finally, this dark crust is cut away, the meat is detached from the bone or sawn in steaks and the Dry Aged Beef is prepared on the grill or in the pan – just like a normal steak. The only difference is that it has nothing in common with a normal steak: the consistency is firm, the fragrance and the taste remind of nut and butter. The secret: oxygen, which tickles the natural enzymes of the flesh – and time. Time, which has made the meat into a perfectly aroma-paket without even a bit of a metallic touch. Our suppliers are the Gori-Hof in Reutte and Thomas Blender from Seeg in the Allgäu!